This September in New England, the girls and I have watched the harvest roll in. My dad’s farm has always been one of my girls’ favorite places, but this time of year might be the prettiest of all the seasons. Out in one of the fields last spring, he planned and planted a pretty fenced garden with extra flowers especially for the girls to cut and enjoy. Right now, it’s busting at the seams with colorful zinnias, towering sunflowers, and ripe fruits and vegetables. In the garden, there is perennial work to do—weeding, watering, and lately lots and lots of picking. Both girls are good at this job. 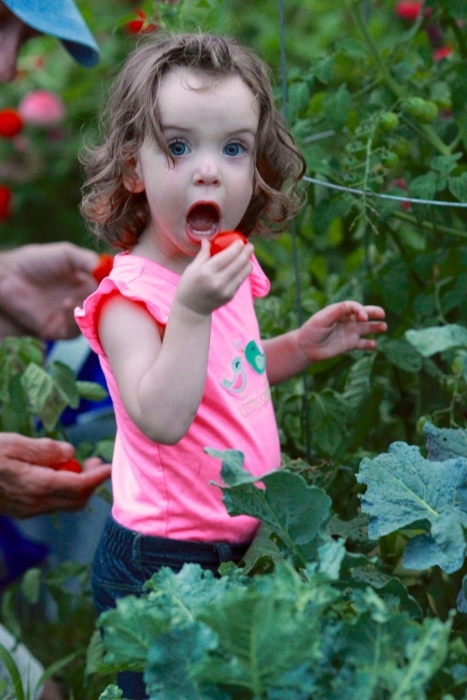 As usual, the littlest one has to taste everything that she picks. We have to remind her to finish the vegetables she samples. Last month we discovered and keep revisiting My Garden, written and illustrated by Kevin Henkes. 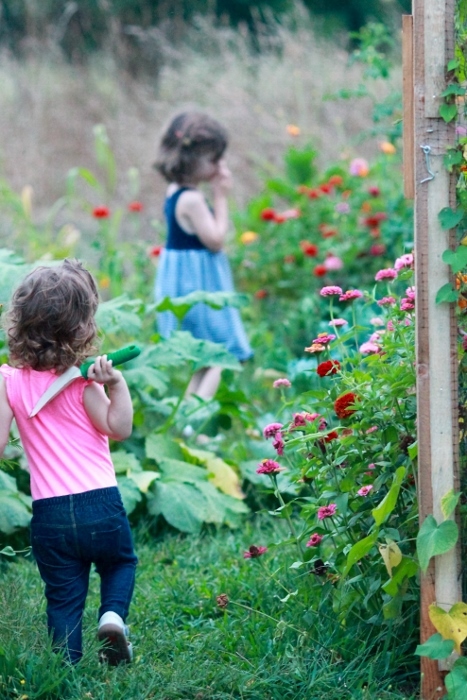 This magical story opens with a little girl helping her mother in their garden. But she then imagines and describes what her own fictional garden would be like. Filled with flowers that never die, chocolate bunnies instead of the real kind, and even a bush that grows jellybeans (I personally wish I had one of those in my yard!). The imaginary garden is a feast for the eyes and the imagination. In her imaginary garden, the little girl would plant unusual things and they would grow like seeds. As the book ends, she plants a seashell in her mother’s real garden, and the final page of the book is that shell, sprouting a root—a little hope that such a magic garden could actually come to be. And really, aren’t all gardens pretty magical after all? What things grow in a garden? We first posed this question when we saw the pages from the book showing umbrellas sprouting from the ground, and we answered it by touring the real garden and looking at picture of gardens. With my 20-month-old, we made it into a silly game asking: “Do [name of thing]s grow in a garden?” to which the girls would respond “yes” or “no!” I threw in some silly things that obviously do not grow in a garden to make them laugh. You could expand this conversation with other gardening books like these that we love: Up In the Garden, Down in the Dirt by Kate Messner, The Vegetables We Eat by Gail Gibbons, and Flower Garden by Eve Bunting. How do they grow? is a great follow-up question to talk about seeds and care for plants. 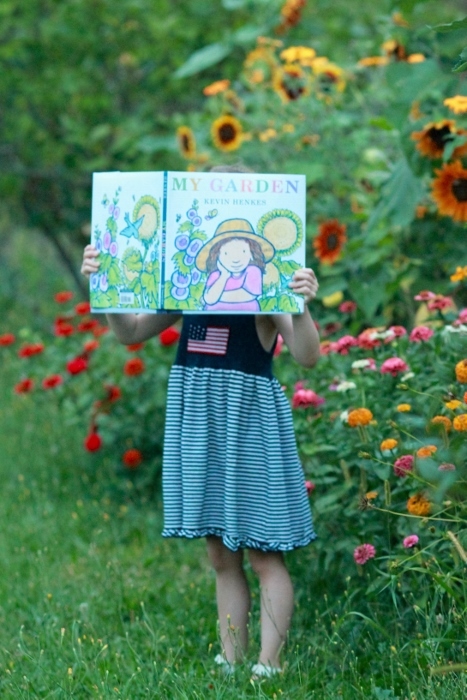 More books to explore are Planting a Rainbow by Lois Ehlert, Oh Say Can You Seed? : All About Flowering Plants by Bonnie Worth for older children, and one of our favorite lift-the-flaps Usborne books, How Do Flowers Grow? Of course nothing beats planting a seed and watching it grow, like Christine and her boys did this spring! What would your own magical garden look like? My four-year-old really got into this one, and even created drawings of her garden! It also featured plants bearing candy. I love that My Garden really sparked her imagination. What are your favorite books about gardens?